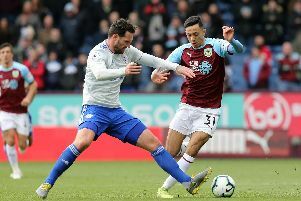 Clarets boss Sean Dyche, while hopeful on a couple of new signings ahead of tonight’s 6 p.m. transfer deadline, feels his squad “isn’t far short”. Dyche landed midfielder Joey Barton on a one-year deal on Thursday night, and, with Matt Lowton and Fredrik Ulvestad close to full fitness, and Dean Marney and Kevin Long stepping up their returns from cruciate knee ligament injuries, the Burnley squad doesn’t look as stretched as it has. Asked whether he was hopeful of new faces before the window closes, admitted: “We might be. “Joey was one of those we were working towards, but he was touch and go. “It was just ironing out the last details of that one. “There are a couple of maybes, and they are maybes. Looking at his squad, he added: “I don’t think we’re far short. Fredi Ulvestad’s getting fit again, so that gives us another option in midfield, Dean Marney’s on his recovery and is down to more like weeks rather than months, so he’s another important body to come back into it. “Joey Barton will get fit.